My parents were not perfect – whose parents are? For that matter, who is? Only Jesus. But I digress. My parents were not perfect, nor did they have a perfect marriage. There were the typical disagreements and arguments any marriage had. There were probably some really hard times that I didn’t even know about. Then there was my dad’s Alzheimer’s. Nothing perfect. But one aspect of my parent’s marriage was almost perfect, and that was their commitment to spending time together every day talking to each other. That simple practice helped them reach the 55 years mark before Daddy passed away. I’ve heard Mom tell stories about their early years many times. Dad was in the Air Force and worked long and irregular hours. But even with difficult schedules, four children born in five years, and ‘would qualify for food stamps if there had been any’ poverty, Mom made time to talk to Dad every day when he came home. Even if that meant two in the morning. I’ve witnessed this commitment to daily talk time more often than I can recount. As a teenager and as a twenty-something young mom. As a starry-eyed newlywed and as a middle-aged wife and mom. I witnessed a simple ritual that would save many marriages, I believe, if faithfully kept. So, today I want to encourage you to adopt this practice in your marriage. Here’s how. First, if necessary, schedule a time to talk to your husband about instituting a new ritual in your marriage: daily talk time. Let him know why this is important to you and how it will benefit both of you, as well as your kids. The point is that your time may change as your season changes, but to keep the commitment. Choose a time and place now for your daily talk time and commit to it. Third, set parameters for your talk time. Review the days’ activities. Talk about the kids, their schooling, and the baby’s new tooth. Discuss meal planning, laundry, and long-term dreams. Leave heavy-duty topics that might cause conflict for scheduled longer talks. Finally, talk daily. Maybe that means dinner is 15 minutes later or bedtime for the kids is 30 minutes earlier. Maybe it means you both get up 20 minutes early to talk in bed or meet for coffee before getting the kids from daycare and school. Be creative but stick to the commitment. Remember when you were dating and couldn’t wait to spend hours talking with each other? Then more hours on the phone when you were apart? 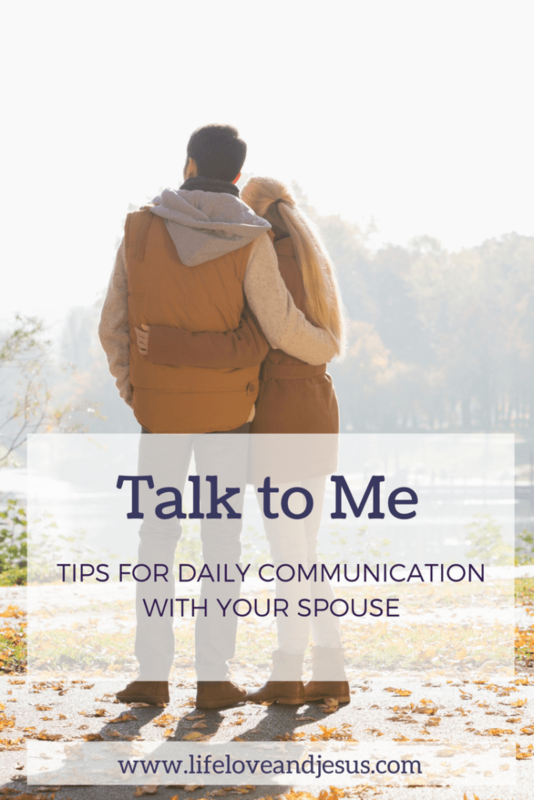 Daily talk time is a commitment to recapturing that feeling of ‘I can’t wait to tell you this.’ Maybe you’ve been married too long that you don’t think you can change an old habit. It’s never too late to start something new and helpful. I think my husband and I could have avoided many problems if we had followed Mom and Dad’s example earlier in our marriage. No matter where your marriage is now, this is the time to start a new a habit that will strengthen it.